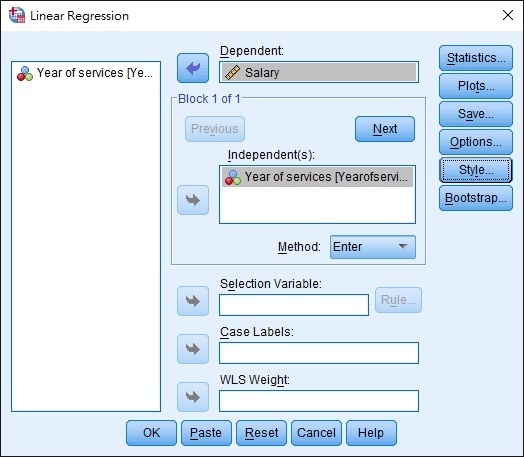 This SPSS Excel tutorial explains how to run Simple Linear Regression in SPSS and Excel. Regression analysis is to predict the value of one interval variable based on another interval variable(s) by a linear equation. We draw a random sample from the population and draw the best fitting straight line in order to estimate the population. The straight line is known as least squares or regression line. 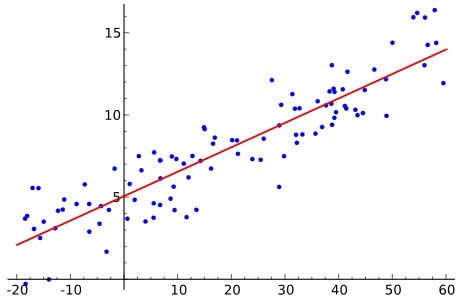 If the linear regression model only has one independent variable, we call it simple linear regression. 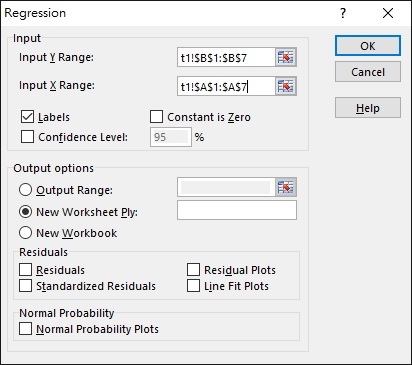 For multiple independent variables, we call it multiple linear regression. In order to find the equation, we use Least Squares Method to help us find a (intercept) and b (slope). 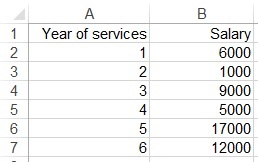 Assume that we want to analyze the relationship between year of services and salary, we draw a sample of 6 employees as below. 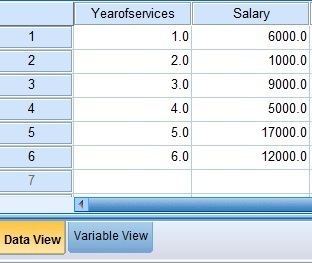 In this example, Year of services is an independent variable (X), while Salary is a dependent variable (Y). Select the data Range as below. Note that X Range is the independent variable while Y Range is the dependent variable. Multiple R is known as Multiple Coefficient of Correlation. +1 is a linear relation, 0 is no relation, -1 is negative linear relation. In our example, 0.7 shows a strong positive relation. R Square is known as Coefficient of Determination, it measures how many percentage of variation in Y can be explained by variation in X, it is 49% in our example. Another important value is P-value, it shows that how significant of each factor is in the Regression model. 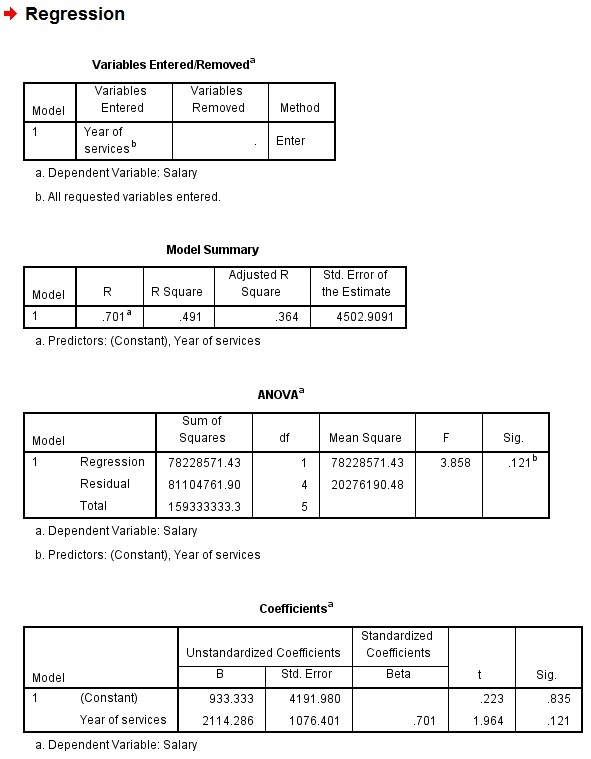 In our example, P value of year of services is 0.12, which is larger than 0.05, meaning Year of Services is not a strong predictor in salary. 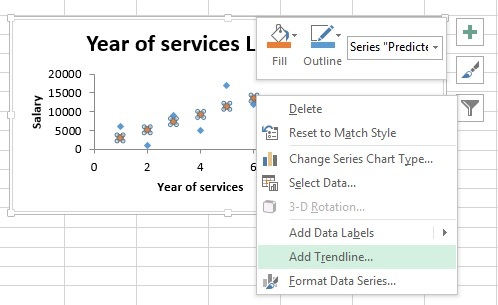 Before we generate the result, there is a check box called Line Fit Plots. If we check the box, we can visually see the least square line. Now we have the least square line instead of dots. According to the graph, when year of services = 2, salary should be 5000 something. The table results and the structures are basically the same as the Excel output.